The Indian telecom sector continues to grow at a breakneck speed. Needless to point out over here, that idle funds always chase growth sectors where the prospects of gaining superior returns are far out-weighed. This wave of optimism is also being echoed by a Boston Consulting Group report which says that the Indian telecom market will surpass a psychological $100 billion-mark by 2015, despite host of concerning factors such as intense competition on the back of low-tariff structures and ensuing decline in ARPUs in the sector. Recently, telecom regulator TRAI released a report on “Indian Telecom Services Performance Indicator Report” for the period covering July to September 2010, spanning across key parameters in Wireless and Wire-line telecom, Cable TV and Radio Broadcasting services in India. The study, compiled from the data furnished by the telecom operators, presents an informative summarized view into the latest trends within the relevant sectors in terms of subscriber growth, preferences and geographical spread for various services. The number of telecom subscribers, from July to September last year, grew from 671.69 million to 723.28 million, registering a growth of 7.68%. Now, just compare this burgeoning growth rate with a decade-ago figures which stood at 7.3 million cellular subscribers as on June 2002; it’s a 100 times jump. However, the optimistic subscriber growth figures notched in Q3-2010 does not get reflected on the ARPUs front for GSM services which declined from Rs.122 at the start of June-10 to Rs.110 by Sept-10. The trend is no different on the CDMA front too. 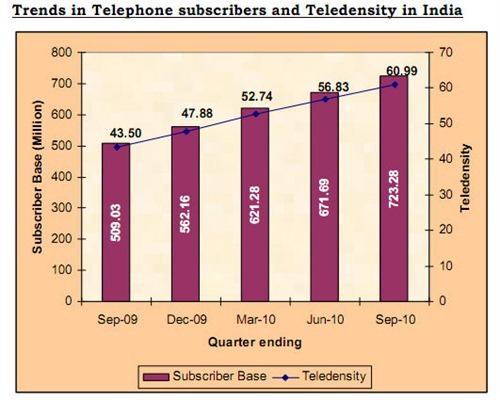 The overall Tele-density in India reached 60.99% as on September 2010. The Urban Tele-density at the end of Sept-10 stood at 137.25, which indicates that every 1 out of 4 urbanites holds multiple mobile connections. 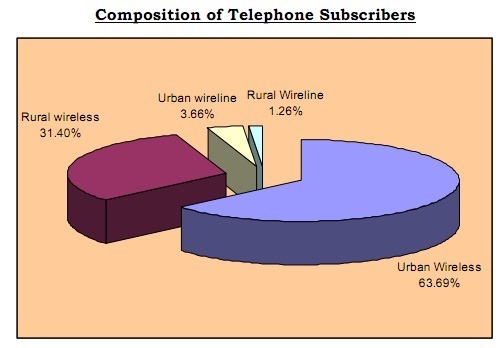 The Rural Tele-density increased from 26.43 to 28.42 during the quarter July-Sept. However, these figures are woefully low when it comes to penetration levels of the operators in the remote rural areas which still remain highly untapped. What further pinches me is that the rural subscription recorded a decline in rate of growth during the quarter from 9.18% to 7.81% in Sept-10, despite low tariffs. 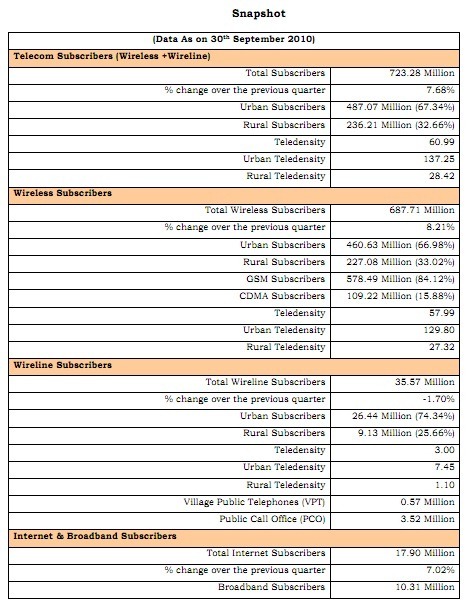 Even as the wireless subscribers log a smart growth, the wire-line subscriber base declined from 36.18 million at the end of June-10 to 35.57 million as on Sept-10. However, the fixed line network is likely to be sustained, though on a very small footprint going forward. Incidentally, even the internet subscribers are growing at the almost the same rate as that of telecom subscribers. It surged from 16.72 million in July to 17.90 million in September. 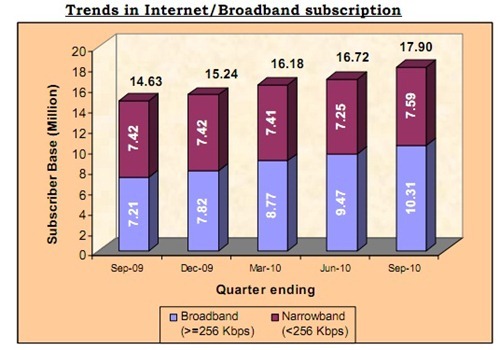 The number of broadband subscribers surged from 9.47 million at the end of June to 10.30 million in Q3 of 2010. As India’s mid-age population turns more affluent, the demand for broadband services has also surged. The share of Broadband subscription in total internet subscription stood at 57.6% at the end of Sept-10. The increased promotional spending by the Corporate India has spurred more and more new channels launches to grab a pie of the popular TRPs. The number of channels with Ministry of I&B has soared to 526 as on Sept-10 end, an addition of 11 channels from a quarter ago period. However, the quarter July-Sept saw no change in the status of number of FM Radio stations at 248, which have gained immense traction over the last 5 years. The age of digitalization of television broadcasting is here which provides advantages of satellite transmission of digital television signal. This has seen the number of Set Top Boxes (STBs) installed in prime metro locations go up to 775,876 until Sept end. Will the Indian telecom industry be able to sustain its scorching pace of growth? Vibrant Gujarat – Surpassing all Expectations! US likely to lift Ban on ISRO & DRDO – Does it really matter? Nice report. Can you also share the product and various services vise distribution along with the CAGR or can you route me to some website where i can get this information. Good info about the industry,would be more relevent if you could publish the circle wise/Operator wise/product wise figures.And also reasons for drop in arpu. Looking forward to some more figures on Cable and Dish Television!